Addison Beecher Colvin (“Cal”) Whipple was the Washington correspondent for Life magazine during World War II, and assigned to cover the Pentagon, the newly completed “War Department” building. 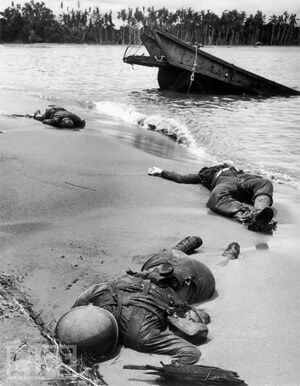 His main job, he explained later, “consisted chiefly of getting photographers cleared to go wherever we wanted them to go” and, “more importantly, getting their pictures cleared when they brought them back.” Life photographer George Strock turned in a shot of three dead American soldiers lying on Buna beach after the battle of Buna-Gora, taken in February 1943. No faces could be seen; one of the men was partially buried in the sand from the action of the tide. It was policy not to allow photos of dead American soldiers, so military censors denied permission to Life to run it. Whipple’s most famous — and gripping — photograph. Whipple’s bosses thought the photo would help Americans see the “reality” of the war, which Americans were “growing complacent about” at the time, so Whipple wouldn’t take No for an answer. “I went from Army captain to major to colonel to general,” Whipple recalled years later, “until I wound up in the office of an assistant secretary of the Air Corps, who decided, ‘This has to go to the White House’.” So he took it to the White House, and asked the president for permission. At the time, Whipple was just 25 years old. In the September 20, 1943 issue, Life ran an editorial explaining that “President Franklin D. Roosevelt, the War Department and the director of the Office of War Information, Elmer Davis, decided “that the American people ought to be able to see their own boys as they fall in battle; to come directly and without words into the presence of their own dead.” Opposite that was the photo, taking up a full page. The public responded by buying a huge number of war bonds to help fund the fighting. The War Department responded by abolishing the censorship rule. Whipple considered it one of his proudest achievements. He was promoted again and again within Time-Life, working as a senior editor, and later as executive editor of the book division. He retired from the company in 1975, and died from pneumonia on March 17 in Greenwich, Conn. He was 94.